Whilst munching on chocolates and sipping on some non-alcoholic cocktails, we took a trip back through the M&S lingerie journey from our first bra in 1926 to today's lingerie innovations. 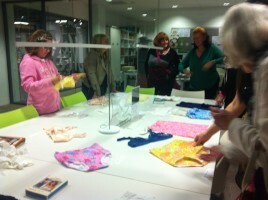 Guests enjoyed talks on the history of M&S lingerie, how M&S support Breakthrough and the great work the charity do. They also had the chance to explore the wide range of lingerie in our collection, the opportunity to get professionally measured by one of the M&S bra-fitters from the Leeds Trinity store and to explore some of the current M&S lingerie collection. We would like to say a huge thank you to everyone that attended and donated to Breakthrough and to the staff from the Leeds Trinity store for offering their time and tape measures for the event!